Banking on our enriched industry experience, we are able to supply Stainless Steel Nail Cutter. - Ideal for people with poor dexterety or weak grip. - Large Plastic Pad can be oparated by fingers, palm or wrist. - Non-Slip base for stability and smooth operation. 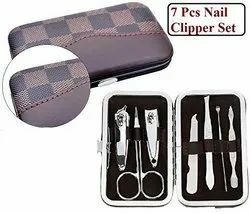 - Helps to make nailcutting and trimming easier and safer. - Attached a 4x magnifier to make cutting clearly only if buying Nail Clipper with Magnifier. 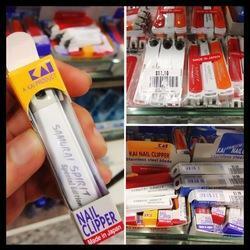 We offer a wide range of Stainless Steel Nail Clipper. These are available in multitude of sizes and are fabricated using good quality raw material. These are custom designed as per the specifications given by the clients and are widely demanded by various industries. Brand: Zwilling J A Henckels Pocket case, neat´s leather, black, 2 pcs. We are a top-notch organisation, engaged in providing Stainless Steel Nail Cutter. - Designed shape of handle is easy to hold, operates firmly. - The size of the front clipper is just fitting to baby small nails. - Enables to watch the nails clearly, to avoid danger from hurting baby finger. In order to meet excellent quality standards, we are supplying Stainless Steel Nail Cutter. Over the years, we have emerged as one of the leading organization, committed towards providing our clientsNail Cutter.Used widely for cutting & nail manicures, the offered cutter is widely recommended in the market. Designed for easy and safer use by adults. Baby nails grow rapidly & should be timed regularly to prevent babies scratching themselves. We are offering Nail Clippers. Description These are extremely useful nail cutters with attached magnifying glass to help you see better. The come in different colors including black and lavendar. Based on in-depth experience and knowledge in the industry, we are efficient in providing Nail Clipper in the market.